When this recipe for an egg and green bean skillet popped up in my RSS feed, I have to be honest and say it didn't jump out at me. But it must have somehow lodged in my mind, because, after the gym and hungry that's exactly what I found myself typing into Google. I got loads of search results! Who knew that eggs and green beans were a thing? Apparently it's a pretty popular dish in Mexico, and as a result has spread into the US as a side dish. 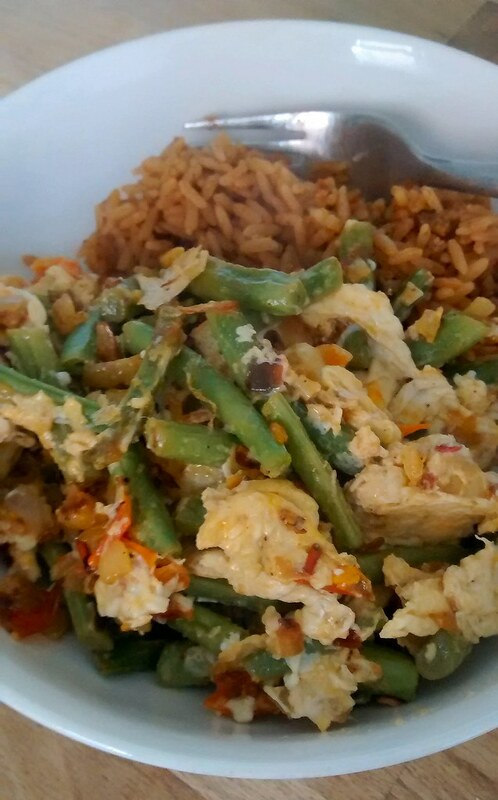 So, loosely inspired by this recipe for Mexican green beans and eggs, this is what I made. In a decent size frying pan, heat the oil over a low heat. Add the onion and cook until soft and translucent. Add the garlic and chilli and cook for a further minute or two. Add the green beans, tomatoes, and seasoning and cook for a further 5-10 mins, until the beans are done to your liking. Add the eggs, and stir. Cook until just set - this will only take a minute or two. Serve immediately. I ate mine with spicy rice, but you could also have it alongside tacos, perhaps with some salsa and beans to make more of a meal of it. A bit of cheese sprinkled over the top (perhaps feta?) would also be nice.